In order to bring Sridama to Nadiya, Lord Nitai arrived at Vrindavana. Reaching Govardhan, He called out for Sridama. 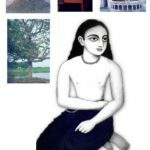 Hearing his name being called out, Sridama came out of his hiding and saw the beautiful form of Lord Nityananda, who was dressed in blue. But being unable to recognize Lord Nitai, he enquired as to who He was. Lord Nityananda revealed that He was none other than his dear friend Balarama, who had appeared in that form in this age of Kali.In order to test whether Nitai was really his beloved Balarama, Sridama proposed that they play a game in which Sridama would clap his hands and run. If Sri Nityananda Prabhu was indeed his dear friend, then He would likely be able to keep pace with him. None but Balarama could keep up with Sridama and catch him while he ran.This is a game that they used to previously play in Vrindavana.Saying thus, Sridama ran around Govardhan four times. Looking back when he saw Lord Nityananda standing beside him, he understood that Sri Nityananda Prabhu was indeed his beloved friend. Meeting after such a long time, the two friends warmly embraced each other and engaged in jovial conversations.Sri Nityananda Prabhu jokingly addressed Sridama as a murkha (fool) ,and lovingly chastised his lack of intelligence for sleeping so long in that cave while an entire Yuga passed by. Lord Nitai said, this is the age of Kali. You foolish cowherd boy, you have spent an entire yuga sleeping in that cave. 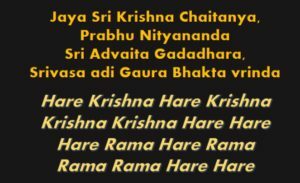 Sri Nityananda prabhu then revealed to Sridama, about the descent of Lord Krishna as Sri Caitanya and His propagation of the great sankirtana yajna (congregational chanting of the the Lord’s Holy names). He apprised Sridama how the Lord missed him dearly and His desire that Sridama accompanied Him in His pastimes. Initially Sridama was reluctant to come to Navadvipa, as he thought that he would have to take a new birth again and was quite weary of the pain involved in residing within someone’s womb. Sri Nityananda Prabhu comforted him saying that he would not have to take up a new body and he could well participate in the Lord Caitanya’s pastimes in his present form.Thus the two friends then happily set out from Vrindavana to meet Sri Krishna Caitanya, the lord of their lives. When Sridama met Lord Caitanya, tears filled his eyes and he was overcome with ecstatic emotions. Lord Caitanya was also overwhelmed ,uniting with his friend after so long .The two embraced each other and contemplated on their sweet pastimes of Vrindavana. Sridama’s body was huge and his stature was too tall for a person of Kali Yuga. Hence Lord Nitai and Sri Caitanya mounted on Sridama’s shoulders as if to swing and play like they did before as cowherd boys.As soon as they mounted upon him, Sridama’s height got reduced and he soon resembled a normal person of this age. Lord Gauranga and Nityananda then proclaimed that from then onwards , Sridama Shall become renowned as Abhirama.The word Abhirama translates to ‘no difference with Rama’ in Bengali. Lord Nitai revealed that in the future, people who were sober in nature shall come to realize that there was no difference between Him and Abhirama Thakura. Sri Abhirama was the most prominent of the twelve cowherd boys who had assisted Lord Nitai manifest His magnanimous pastimes. The others being Sri Gaudidasa Pandita (refer – The worshipable deities of Gaudidasa Pandita, Ambika Kalna), Sri Uddharana Datta Thakura (refer – Sri Uddharana Datta Thakura Sripat, Adisaptagram (Near bandel) ), Sri Kamalakara Pippalai (refer – Sri Jagannatha Temple of Mahesh, Serampore), etc. Sri Abhirama had widely preached the conclusions of Krishna Consciousness and was instrumental in delivering innumerable fallen souls during his manifested pastimes. In Sri Caitanya Caritamrta (Adi, 11.14-15) , it is stated that when Lord Nityananda was ordered by Sri Caitanya to go and preach in Bengal, Sri Abhirama Thakura was sent along with Him. Thus Sri Abhirama Gopala is counted among the associates of both Sri Caitanya as well as Sri Nityananda. Sri Abhirama was one of the chief branches of Lord Caitanya’s desire tree of devotional service. Srimati Malini devi, the wife of Sri Abhirama Thakura, was an expansion of his potency. She appeared to assist Sri Abhirama Gopala manifest his sweet pastimes.Her appearance and activities are very unique and hearing them carefully can plant the seeds of devotion, even within the heart of an atheist. By the will of Sri Abhirama,a little baby girl once appeared in Vrindavana, and being encaged in an iron box she came floating through Yamuna all the way to present day Khanakul, in Bengal. The dead plants on the shores of Khanakul , sprouted back to life as soon as they came in contact with this iron box. Being amazed, the local gardener opened the box and on beholding the divine form of Malini Devi fell down upon the ground unconscious. The entire garden by the shore was now in full bloom. All the dead and decaying plants had received a new life. Other gardeners rushed to the spot and on obtaining darsana of the divine baby girl, they paid her their humble obeisances. Srimati Malini devi blessed them all and expressed her desire to be sumptuously fed ,since she had been fasting inside the box for many days. She revealed to them that her name was Malini and that she had appeared in order to assist Abhirama Thakura in his pastimes.The villagers considered themselves exceedingly fortunate to have received the blessings and service of such a divine personality. 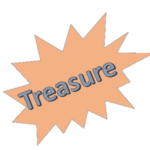 In those days ,Khanakul was known by the name Kazipur.It so happened that the Kazi (local magistrate) who had authority over the place, somehow came to know that the villagers had received some valuable treasure in an iron box. He sent soldiers in order to arrest those gardeners who were in possession of the treasure. On being arrested, the gardeners revealed the entire story to the kazi and informed him how the treasure was not some petty material riches but instead a divine personality. Understanding the significance of Malini devi’s sacred appearance, the kazi felt ashamed of his misdeed and immediately released his prisoners. He expressed his earnest desire to bring Malini devi to his home and worship her. The kazi was a muslim, but he agreed to serve Srimati Malini Devi with all the required paraphernalia required to worship a Hindu goddess. It is because he had realised that petty religious demarcations should not become an impediment for one’s spiritual progress. Srimati Malini devi agreed to be worshipped by the kazi. 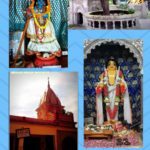 On Srimati Malini Devi’s wish ,Kazipur ,henceforth, came to be known as Khanakul, and the place is thus known ever since. Sri Abhirama soon met with Srimati Malini devi and after getting married, they began residing together here at Khanakul. Sri Abhirama was a very powerful personality and atheists used to flee at his sight. It is said that if Abhirama Thakura bowed down to any person who was not the Lord, or empowered by the Lord, then that person would die immediately. Similarly if he bowed down before any stone that was not a saligrama sila, then that stone would immediately crack. Sri Nityananda Prabhu’s seven sons had died because Sri Abhirama had paid them his obeisances. Finally Sri Ganga Muni devi and Birchandra prabhu were born and were unharmed even after Abhirama had bowed down before them.Understanding that they were divine personalities, Sri Abhirama became overwhelmed with ecstasy and composed verses to glorifying them. 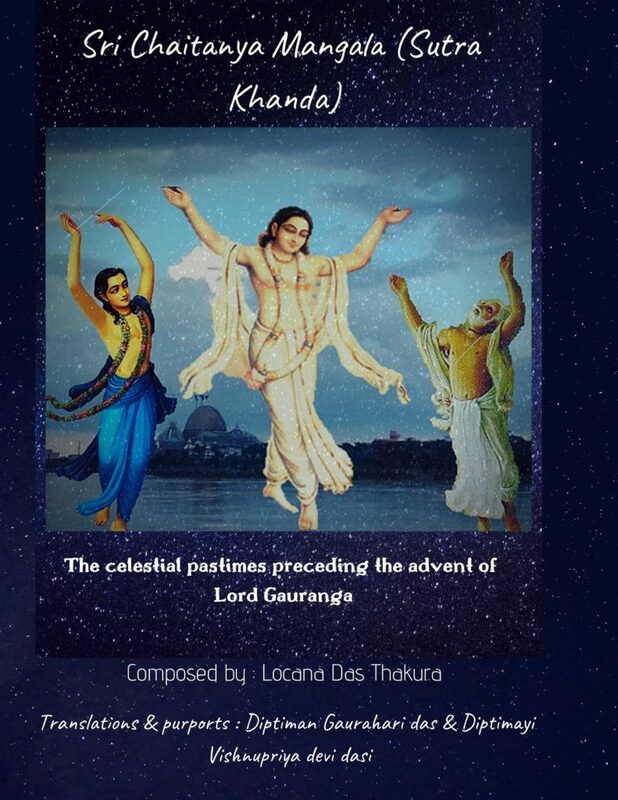 ‘The Gaudiya Treasures of Bengal’ has covered the appearance pastime of Birchandra Prabhu in a separate article entitled – ‘Kunja Vatika, Khardaha’. Similarly little Raghunandana Thakura , the son of Mukunda Das, was also tested when Sri Abhirama had paid Him his obeisances.Being an expansion of the Lord Himself, Sri Raghunandana however was unaffected .On seeing this, Sri Abhirama became overjoyed, and engaged in an ecstatic dancing kirtana with Him. During this intoxicated dance that took place at Baradanga (near Srikhanda,Katwa), one of the anklets of Raghunandana thakura fell off from his feet and flew several kilometers away at a place called Akaihata ,where it created a pool upon landing (refer – ‘Sri Kaliya Krishna Das’ Headquarters , Akaihata’). 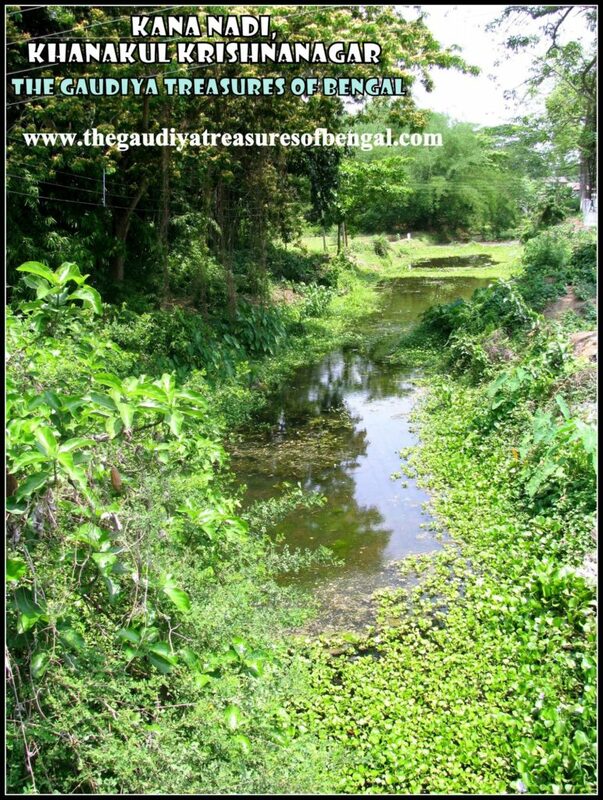 The pool (known as Noopur kunda) exists even today and ‘The Gaudiya Treasures of Bengal’ considers itself immensely blessed to have taken darsana of this sacred place. 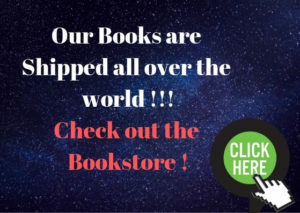 ‘The Gaudiya treasures of Bengal’ has covered the meeting pastimes of Sri Abhirama and Raghunandana in a separate article entitled – ‘The Great Vaishnavas of Srikhanda’. Similarly several deities ,all over bengal,had burst into pieces not being able to tolerate the obeisances of Sri Abhiram Gopala. Again, the glories of several deities were further enhanced, when they did not crack even when Sri Abhirama bowed down before them. Some of these revered deities who remained intact are Sri Madana Gopala jiu of Bishnupur, Sri Krishna Raya of Garbeta,etc. Anyways let us return to our present discussion.Here at Khanakul, at the Sripat of Abhirama Thakura, is worshipped the most mesmerizing deity of Sri Gopinatha.Gopinatha jiu had once appeared in Abhirama’s dreams and informed him of the place where He was buried inside the ground.On His orders, Abhirama Thakura immediately started digging that place and recovered Gopinatha jiu. 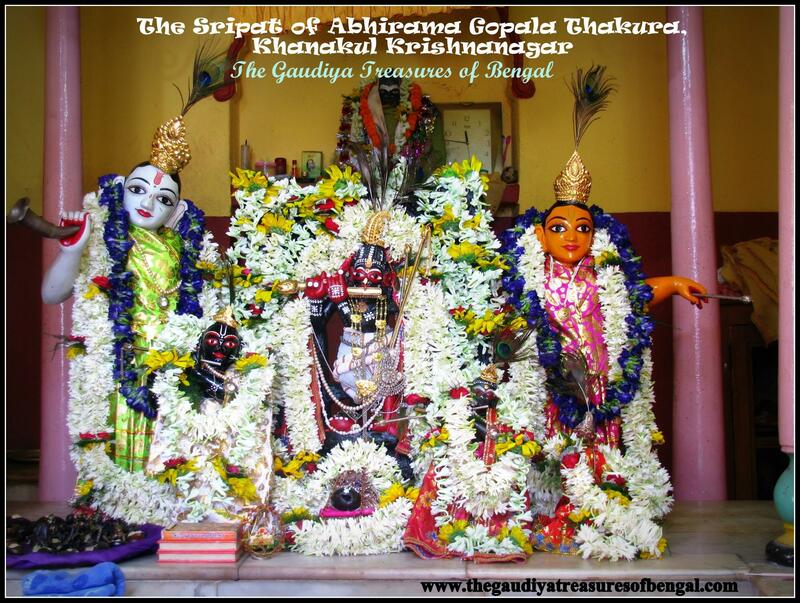 Thereafter Srimati Malini devi , Abhirama Thakura and their disciples installed Sri Gopinatha at Khanakul with great pomp and show. Merciful Gopinatha jiu continues to bestow His enchanting darsana and accept our humble service at Khanakul till this day. On the right of Gopinatha jiu is installed a beautiful deity of Lord Nityananda. And on His left is kept a beautiful deity of Sri Abhirama Thakura.Sri Abhirama Thakura had finally wrapped up his earthly pastimes by merging with his deity kept in the altar. The place from which Sri Abhirama Thakura had once excavated Gopinatha jiu, has turned into a pool, and is today renowned as Ramkunda. 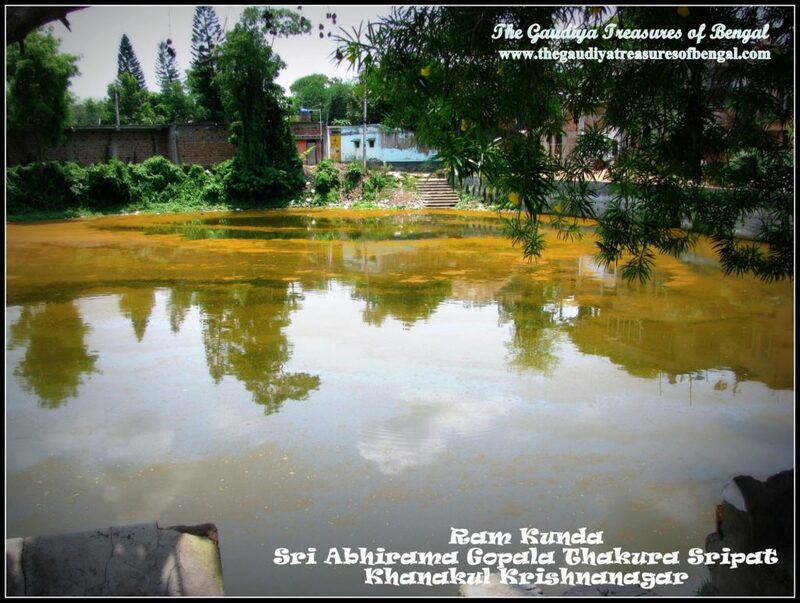 The sacred pond has been named after Sri Abhirama Thakura and is situated just outside the temple premises. 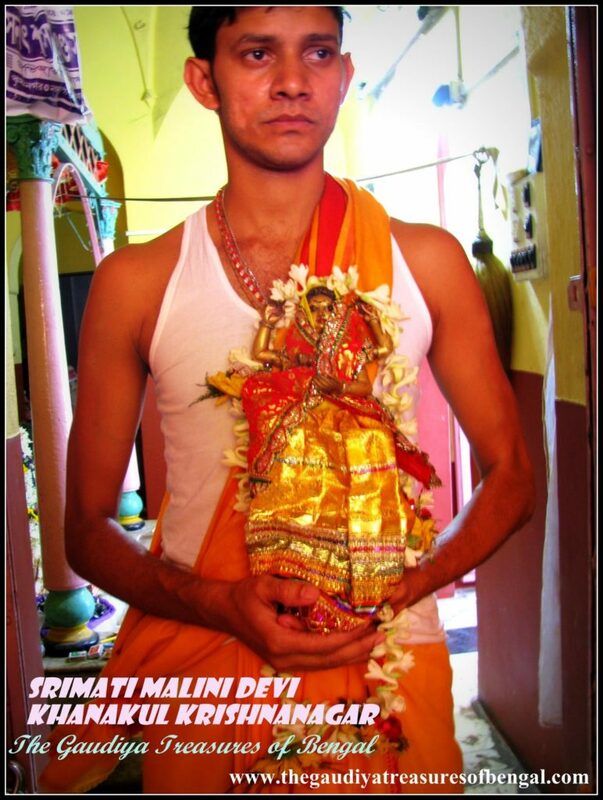 There is another deity of Srimati Malini devi, who is also worshipped here in this temple. However this deity of Malini devi does not give her darsana to everyone and she is generally kept hidden from public view. If someone humbly requests the temple priest, he might mercifully allow the person to take her darsana. When we visited the place,however, we were really fortunate to receive her darsana and to have seeked for her causeless mercy. Once Lord Gaurahari, Nityananda prabhu and their associates had arrived at Khanakul Krishnanagar, in order to take darsana of Gopinatha jiu and attend the grand feast that Sri Abhirama Gopala Thakura had arranged. After offering bhoga to Sri Gopinatha , the prasadam was served to the guests by Srimati Malini devi herself. While she was serving the prasada, the wind blew away the covering of her head. As her hands were engaged in holding the serving plates ,she was unable to rearrange her saree to put back the covering. As a result her hairs fell down and flew all over her face. In those days,in an orthodox bengali culture, it was considered inappropriate for a lady to have her head uncovered before her seniors, and as a result Srimati Malini devi felt very ashamed. Hence in order to rescue the situation ,she manifested two more hands from behind, with which she rearranged her saree.Seeing the four handed form of Malini devi, all present were convinced of her divine personality and paid her their due respect. The captivating deity of Srimati Malini devi that is worshipped here in this temple, depicts her in this four handed form, with which she tries to put the covering of her saree back upon her head. 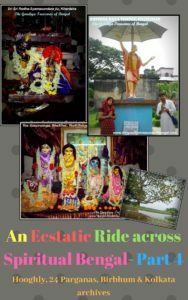 A huge festival is celebrated every year here at Khanakul, in the month of March-April (Chaitra) on the Krishna Saptami tithi ,in order to commemorate this grand feast ,that had taken place five hundred years ago, in which great spiritual personalities including the Supreme Lord had participated wholeheartedly. This grand feast was served under the shades of a bakul tree, that stands tall at the temple entrance even today.The tree is renowned today as the Siddha Bakul, and its a witness to the glorious days gone by. Sri Abhirama Thakura used to play a flute that was made out of a tree’s trunk. This flute, was so heavy that it was not possible for even sixteen men to lift it together.Sri Abhirama used to play on this flute out of ecstatic love for the Lord. One tiny portion of this flute (tree) was once planted upon the ground by Sri Abhirama, and this led to the birth of this Siddha Bakul tree. One particular characteristic of this glorious tree, is that throughout the year it produces only flowers. At no time of the year does it produce any fruit. Seeing this tree, we were reminded of other Siddha Bakul trees that serve the various dhams across Bengal. For example the samadhi of Sri Vasudeva Ghosh at Tamluk is protected under the shades of a Siddha Bakul tree (refer – ‘Narpota,The Sripat of Sri Vasudeva Ghosh , Tamluk’). 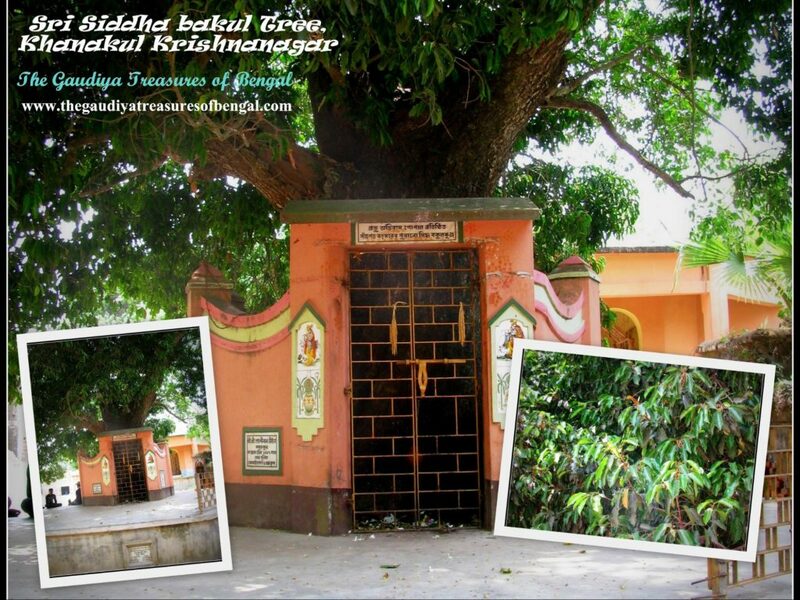 Again at Ekachakra, the birthplace of Lord Nitai, the sacred Bakul tree acted as a shade for Nityananda prabhu to rest, after He became tired playing (refer – ‘Sri Ekachakra Dham – Birthplace of Lord Nityananda’). Just across the road, opposite to the temple, flows a small river. It is more like a canal today, but is said to have been a great river in the years gone by.The river was once cursed by Sri Abhirama Thakura as it had carried away his kaupina (undergarment) while he was bathing in it.The river is said to have slowly dried up since then and is today popularly known as ‘Kana Nadi’ (blind river). Sri Abhirama Thakura had a horse’s whip ,renowned as ‘Jaya Mangala’. If someone was struck with that whip thrice, that person would immediately be overwhelmed with an ecstatic love for the Lord. On the orders of Srimati Jahnava mata, Srinivasa Acharya visited the sripat of Sri Abhirama Thakura ,here at Khanakul, before setting out for Vrindavana. After testing whether Srinivasa was an appropriate candidate, Abhirama Thakura struck him thrice with his Jaya mangala whip.As soon as he struck him thrice, Srinivasa became immersed in an ocean of ecstasy, getting intoxicated with an intense love for the lord. This sweet pastime had also taken place here is covered in a separate article entitled – ‘Sri Srinivasa Acharya’s Sripat, Jajigram (Near Srikhanda, Katwa)’. We worship the lotus feet of our spiritual master ,whose causeless mercy has empowered us ineligible fools ,to gain entrance and take up service in this exalted abode of Khanakul Krishnanagar. We seek shelter of this holy land, and pray that its glories remain forever imprinted in our heart.‘The Gaudiya Treasures of Bengal’ offers millions of obeisances and humbly prays to Sri Abhirama Gopala and Srimati Malini devi that we advance in our Krishna consciousness, develop attachment unto the lotus feet of Sri Gaura Nitai and are able to serve Sri Guru & Vaishnavas, by our honest and sincere efforts. We seek their blessings and compassion , in successfully rendering this humble service of reciting the pastimes and revealing the pastime places of the Supreme Lord and His beloved associates.We shall consider ourselves greatly fortunate and our existence meaningful if Lord Gaurahari and our dear spiritual master are kindly pleased with our endeavours. Beautiful deities of Sri Gopinatha , Lord Nityananda, Sri Abhirama Gopala Thakura and the other deities being worshipped in the altar. One can take a local train from Howrah/ Sealdah and get down at the Tarakeshwar station. 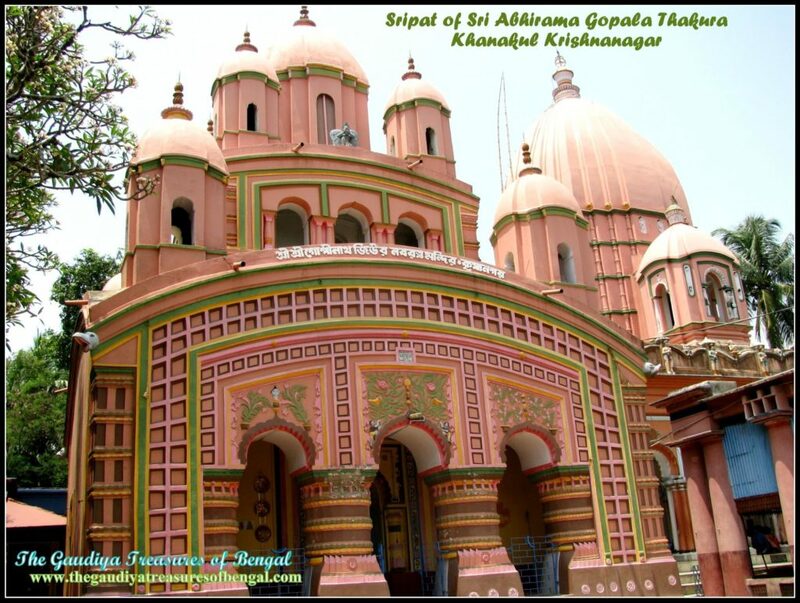 From there one can take a bus to directly reach the Sripat of Abhirama Thakura at Khanakul Krishnanagar. 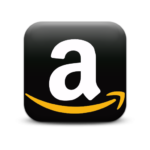 The train journey takes about 1.5 hours while the bus will take an additional 1 hour to reach the destination. 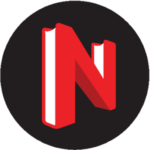 Accommodation – One can choose to stay in any of the hotels of Tarakeshwar. 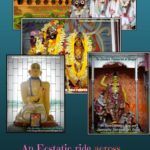 But as this place is not very far from Kolkata, it is recommended that one stay in Kolkata and then travel to take darsana of this exalted dham. 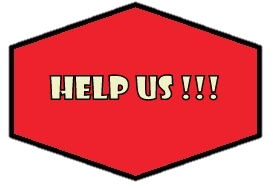 One is requested to contact the Khanakul temple authorities to avail prasadam.